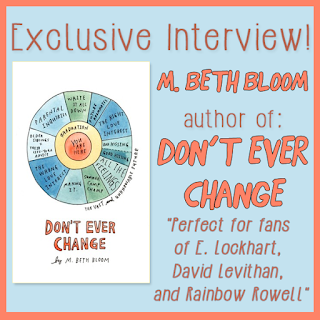 We're excited to have M. Beth Bloom here to tell us more about her latest novel DON'T EVER CHANGE. The hardest scene to write was Eva’s goodbye to her campers. I had no idea how to write it, where to set it, and the depth of the emotion necessary. I knew I wanted readers to feel it, and Eva had to feel it, but I tend to shy away from truly overt, sappy moments. It had to ride the line of being moving but not cloying. I’m proud of the scene for sure, but really I’m most proud of the last few pages, as those are always the strangest and most terrifying to write. Girl, by Blake Nelson. 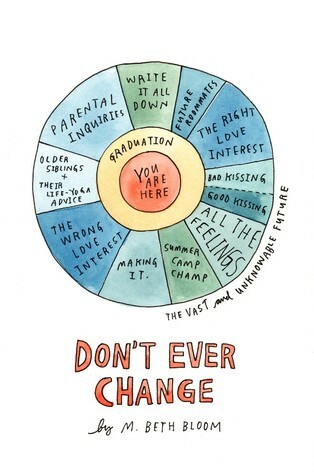 The Basic Eight, by Daniel Handler. How long did you work on DON'T EVER CHANGE? It started out as a collection of stories that I wrote a few years ago. They were just personal writing exercises that I never imagined I’d revisit. Once I dipped back in, it was about a year until completion, but only after reworking, re-ordering, expanding, altering, and on. Eva is my forever writing voodoo doll. 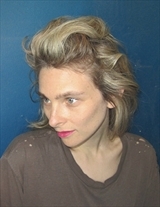 I created her to work out my own problems with writing – that obsessive desire to be super epic and memorable and unique and yet still write from a personal place that’s soulful to my own experience. She was a perfect creation to exorcise the pretentious demons and the judgmental demons and the overly critical demons. Also she makes me laugh at myself, which helps. What do you hope readers will take away from DON'T EVER CHANGE? I just want Eva to connect with readers who aren’t solely searching for a protagonist that saves lives, saves the world, fights the paranormal, dies of harsh diseases, etc. She’s just an actual flawed, arrogant, funny weirdo, and I hope there’s a place for her among the current YA heroines. The writing, the editing, the killing of darlings and taking of constructive criticisms is always long and hard, but my agent, Ann Behar, is incredible and she fought for my first novel, Drain You, until she got a yes. And there were No’s for sure. This is my second book, and there’s absolutely a full novel cozy on my laptop that no one’s seen. I still don’t know what the key to writing a novel is. Some of my favorite writers wander and poke around and it’s incredible. They can be so competent while seeming aimless; that’s what I aspire to cultivate in my style. But mostly I’m a minimalist and I use descriptive language sparingly. So my AHA moment comes when I’ve omitted all my needless words and paragraphs and I’ve gotten to the rightest, tightest bits. I can’t listen to a single sound or look at a single thing other than the blank page, and that includes the internet, my phone, my boyfriend, my lunch. I sit completely still and try not to even pee! I can’t be in public at all because I have to talk out loud to myself and sometimes pace. I wake up, sit at my desk, thumb through my beat-up thesaurus and go until I need a tiny bit of food or a nap, then get back at it until dinner. Don’t take yourself too seriously while writing. Laugh at your own words, see the funny in the sad, be touched by cleverness and wit. And always start in the middle. My first feature film, LADYWORLD, set to shoot this August in Los Angeles. What did you think of our interview with M. Beth Bloom, author of DON'T EVER CHANGE? Let us know in the comments!